Since the previous post, I have been playing around with more variations on Truchet tiles (using this page). 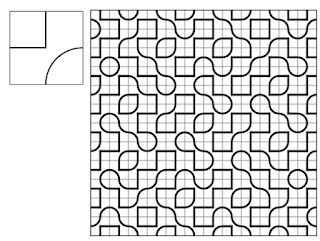 The variety of appealing patterns that you can create from these simple tiles is impressive. For example, using this simple base tile you can create a path-like effect, even to the extent that paths can seem to weave under and over each other. 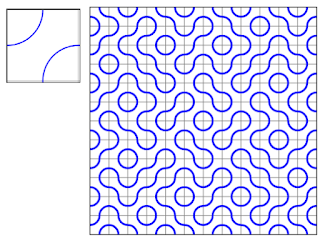 The patterns below use this effect to suggest links and knots. Slight variations in the base tile can produce interesting effects. Here's an example that uses the traditional Truchet base tile. 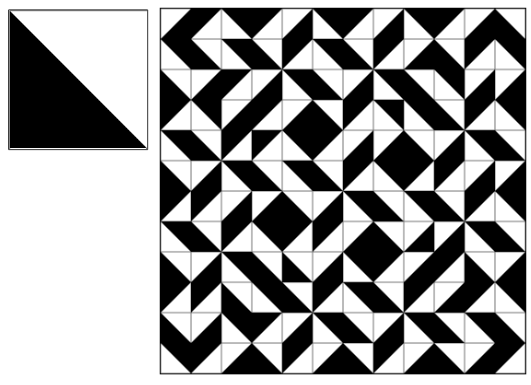 Bulging the dark right triangle into a quarter circle allows us create something that looks quite different, even though it consists of exactly the same tile placements. 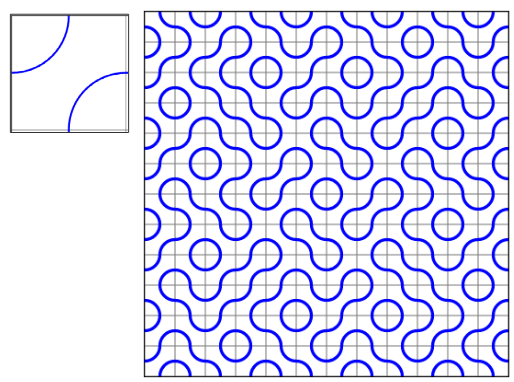 Squares are replaced by circles, V-patterns replaced by tulips, and we end up with organic and densely packed patterns. A common variation on the Truchet tile is the Smith tile, which consists of two quarter circles at opposite corners. 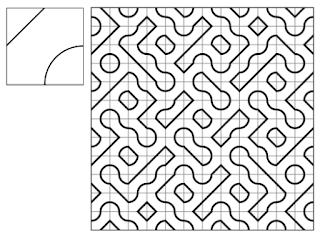 Unlike the traditional Truchet, the Smith base tile has 180 degree symmetry, but because it lacks 90 degree symmetry, it can still be used to produce interesting and appealing patterns (if we had quarter circles in all four corners, the constructed patterns would always be the same - an array of circles). 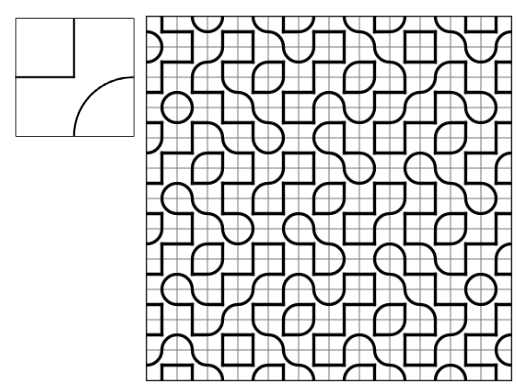 Using this tile, we end up with circles and blobby regions that create paths and zones across the grid. 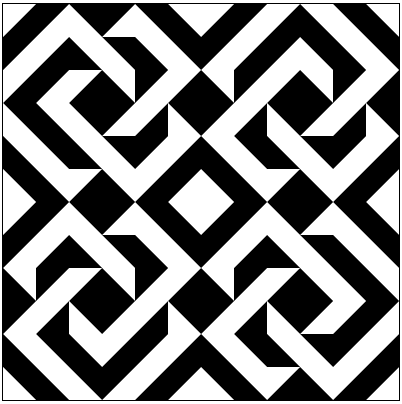 A small change to the Smith tile allows us to eliminate the 180 degree symmetry and regain the expressiveness of the traditional tile patterns. 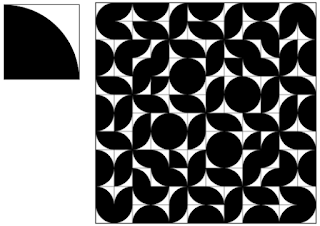 For example replacing one of the quarter circles with a square means that some circles in our original pattern become squares, some remain circles, and some take on a lemon-shape, while the overall pattern retains the same topology as it has in the Smith version. 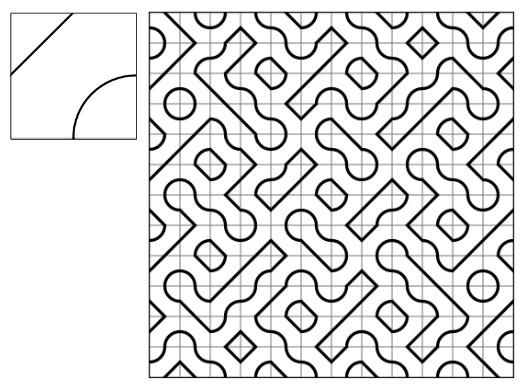 Another small change (using a diagonal line in place of the square) produces patterns that look quite different at fist: our paths now resemble strange jigsaw shapes. A closer look shows how the essential features are retained. Even with all the possible variations, the original tile retains its charm. 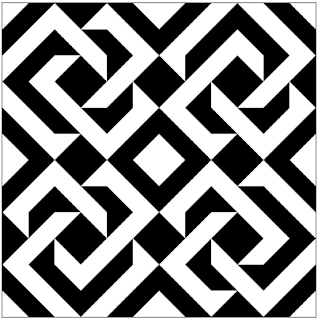 Can you see the four trefoils in the pattern below?